One of the hallmarks of eukaryotic cells is the presence of membrane-bound compartments (organelles), which create distinct, optimised environments to promote a variety of metabolic reactions required to sustain life. Organelles are the functional units of a cell. Like different parts of a production line in a factory, they perform specialised functions but also depend on each other. Mitochondria, for example, organelles responsible for the cell’s energy production, are fuelled with carbohydrates and fatty acids from other compartments and are linked to another organelle, the endoplasmic reticulum, that is involved in the processing of proteins and the production of lipids. To adapt to the changing physiological requirements of a cell or organism, organelles must constantly adjust their number, shape, position and metabolic functions accordingly. This requires dynamic processes which modulate organelle abundance by organelle formation (biogenesis), degradation (autophagy), or inheritance (cell division) as well as mechanisms to mediate organelle movement, interaction, communication and cooperation (see figure one). How these dynamic processes are mediated and regulated in the cell is an important and challenging question in modern cell biology. 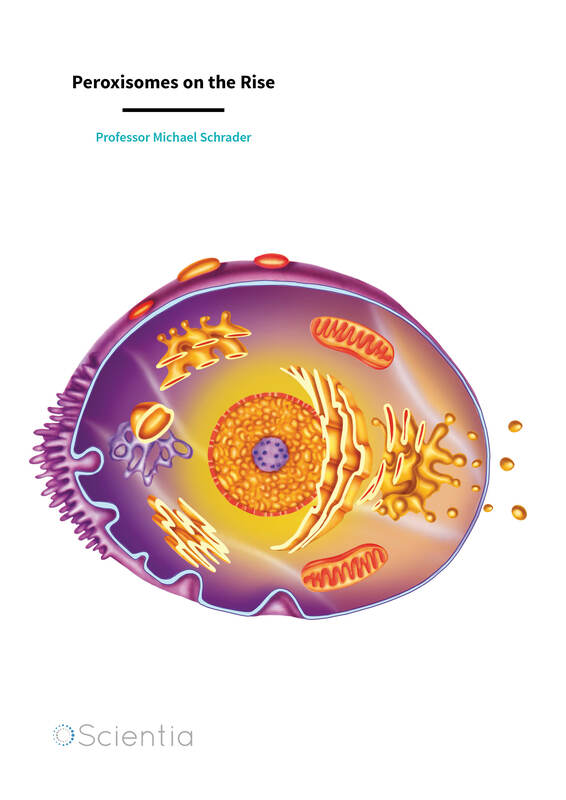 Professor Michael Schrader’s research aims to unravel the mysteries of how organelles are formed and how they interact with each other and respond to changes in their environment. ‘Our goal is to understand the relation of organelle dynamics to organelle functionality and its impact on developmental and physiological processes,’ says Professor Schrader. The team focuses their work on organelles called peroxisomes. 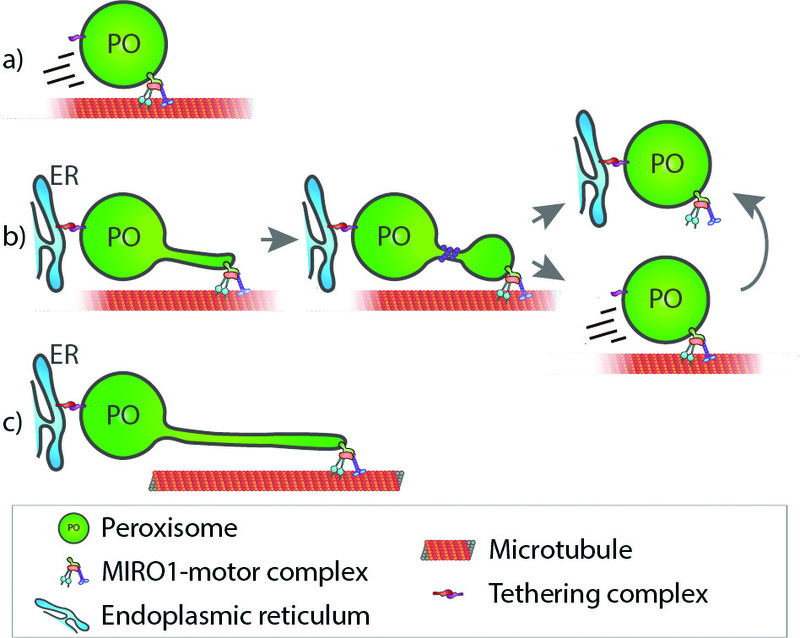 Peroxisomes (PO) are small, highly dynamic membrane-bound organelles with a granular interior. They belong to the basic equipment of the cells found in mammals, plants and fungi. However, their functions can vary significantly depending on the organism, cell type and environmental conditions. They were first discovered and named ‘microbodies’ in 1954 by a Swedish PhD student called Johannes Rhodin. The microbodies were then renamed ‘peroxisomes’ by the Nobel Prize winning cell biologist Christian De Duve, who isolated them, along with some of their characteristic enzymes involved in the production and breakdown of hydrogen peroxide (H2O2). Hydrogen peroxide falls into a class of molecules known as reactive oxygen species that perform important signalling functions in the cell but when produced in excess can contribute to cellular damage, thought to be involved in ageing, cancer and neurodegeneration. Enzymes found in peroxisomes, such as catalase, break down hydrogen peroxide into harmless water (H2O) and oxygen (O2). Another important role of peroxisomes is their involvement in cellular lipid and energy metabolism. Peroxisomes are required for the breakdown and detoxification of fatty acids, in particular very long chain fatty acids, that cannot be degraded elsewhere in the cell, and the biosynthesis of etherlipids that are important constituents of cellular membranes and the myelin sheaths that insulate nerve cells. Loss of peroxisomal functions has been linked to several inherited disorders such as Zellweger Syndrome that are often progressive and severe and characterised by developmental defects, the loss of myelin from nerve cells, neurodegeneration, eye problems and deafness. In addition, peroxisomes have a role in bile acid production in mammals, photorespiration in plants, penicillin production in filamentous fungi and glycolysis, the breakdown of sugar, in Trypanosome parasites. The latter makes peroxisomes important targets for drug development against sleeping sickness – their involvement in the production of several secondary metabolites in fungi means that peroxisomes are also of biotechnological and industrial interest. It became evident in recent years that peroxisomes also fulfil crucial non-metabolic functions, for example in cellular stress responses, the combat of pathogens and anti-viral defence, as cellular signalling platforms, in cell fate decision and in healthy ageing. These findings highlight the general importance of peroxisomes in human health and their significance in common age-related disorders. Peroxisomes contain many enzymes and proteins, both on their interior and bound to their membranes. Remarkably, many of the membrane proteins involved in organelle division and anti-viral signalling are shared by peroxisomes and mitochondria – they belong to a specific group of ‘tail-anchored’ membrane proteins – as they insert into membranes via a short membrane-spanning region at their end. These adaptor proteins are involved in many cellular processes that occur close to or at membranes, such as organelle division, and mutations that affect their function are associated with severe medical disorders. Targeting signals are used by proteins for getting them from where they are made to where they should be. These signals function like a postcode. This code is recognised by cellular machinery that acts to transport proteins to the appropriate location. Once made in the cell’s cytoplasm, these adaptor membrane proteins have to be distributed to their target organelles including the endoplasmic reticulum, mitochondria and peroxisomes. Professor Schrader and his team have studied the molecular characteristics of the part of the membrane proteins that determine exactly which organelle they end up in. This is specified by the membrane-spanning regions of the proteins. Professor Schrader’s team has discovered that differences in this region can determine organelle targeting. Using technology developed for the purposes of weather forecasting, Professor Schrader and his team tracked where specific proteins were becoming anchored to the membranes of organelles and demonstrated that by altering the targeting sequence, the organelle ‘post-code’, they could cause peroxisomal proteins to be sent to the mitochondria and vice-versa. Research in Professor Schrader’s team has revealed that peroxisomes in mammalian cells are very dynamic – they can move along cytoskeletal tracks by recruiting molecular motor proteins but can also undergo shape changes and form highly elongated tubular membrane extensions (see figure one). The team discovered that those membrane extensions, which form from pre-existing peroxisomes, can constrict and divide into new peroxisomes. This process of peroxisome ‘growth and division’ contributes to the formation and multiplication of peroxisomes. This is important because peroxisome number must be carefully regulated. While too few peroxisomes or loss of their function can lead to neurological defects, prolonged treatment with drugs that increase the number of peroxisomes in rodents has a carcinogenic effect, producing liver tumours. Over the years, Professor Schrader’s lab has identified and characterised several key proteins of the growth and division machinery. They found that a key division factor of peroxisomes is a protein also found at mitochondria called DLP1/Drp1. Drp1 forms a ring-type structure around the elongated membrane, which then tightens around it until the membrane is cleaved, releasing a new peroxisome as an independent structure (see figure one). The team discovered that the division of peroxisomes requires additional membrane proteins that are also shared with mitochondria. These findings supported the discovery of a novel group of disorders with defects in both peroxisomal and mitochondrial division. These disorders differ from the classical peroxisome biogenesis disorders such as Zellweger Syndrome, as the metabolic functions of peroxisomes are not significantly affected. This makes diagnosis by biochemical tests difficult. 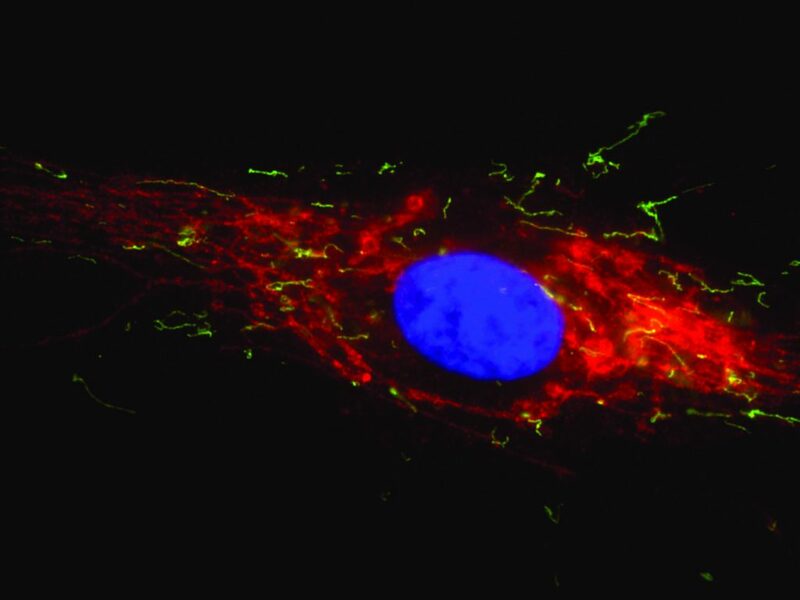 However, microscopic analysis revealed that the peroxisomes and mitochondria in patient cells are often abnormally long, as they cannot divide (see coloured image below). This may impact on their movement and distribution, especially in nerve cells. The Schrader team has also been investigating the functional role of the membrane-remodelling protein Pex11β. This protein is required for membrane elongation of peroxisomes in the early stages of their division process, but Professor Schrader’s lab and his collaborators have discovered that it is also involved in the final stages of peroxisome division, by activating the fission enzyme DLP1/Drp1. Patients with mutations in the PEX11 gene show normal or only slightly altered peroxisomal metabolism but peroxisome number and morphology is altered. These patients suffer from neurological abnormalities, eye problems and hearing loss. These findings highlight the importance of peroxisome dynamics and regulation of peroxisome number in disease conditions and suggest that peroxisomes, that contribute to H2O2 and reactive oxygen species balance, breakdown of toxic lipids and combat of pathogens, have important protective functions. The discovery, that peroxisomes and mitochondria share key proteins of their division machinery, and that combined peroxisome-mitochondria disorders with defects in organelle division exist, has further strengthened the concept of the ‘peroxisome-mitochondria connection’ indicating that both organelles maintain a very close interrelationship which impacts on human health. Besides an overlap in key division components, their functional interplay also includes metabolic cooperation in the breakdown of fatty acids. Peroxisome-mitochondrial communication has also been demonstrated to have a role in mounting the first line of defence against viral infection, signalling the immune system into action. In addition to having complex, though not yet well understood, roles in antiviral defence, both peroxisomes and mitochondria are also targeted by certain viruses, becoming viral assembly points upon infection. There is also evidence for cooperation between peroxisomes and mitochondria in controlling levels of reactive oxygen species within the cell, with research now showing that increasing levels of reactive oxygen species in peroxisomes quickly leads to changes in reactive oxygen species activity in mitochondria. The exact nature of their communications is still elusive but has been observed in the form of physical connections between the organelles, as well as in mitochondria-derived vesicles – small, spheres of lipids used to transport cellular components, such as proteins – that may be targeted to peroxisomes. Peroxisomes may link up with another important organelle. Scientists have known for some time that vital cellular processes, such as the production of myelin sheath lipids, rely on interactions occurring between peroxisomes and the endoplasmic reticulum (see figure two). Until recently, however, little was known about the molecular nature of these interactions. Professor Schrader and his team identified two novel adaptor proteins at peroxisomes, called ACBD5 and ACBD4. He and his team discovered that ACBD4/5 binds to another adaptor protein at the endoplasmic reticulum, called VAPB (see figure three). 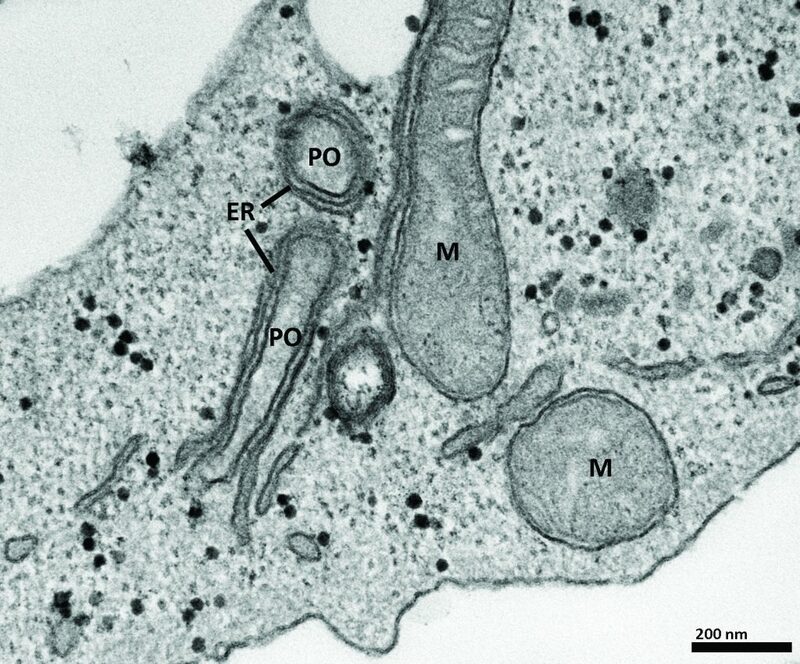 Using quantitative electron microscopy, they showed that this interaction results in the formation of narrow membrane contact sites between peroxisomes and the endoplasmic reticulum (see figure two). When the team disrupted this interaction genetically, they not only found that peroxisomes became significantly more mobile, but that there was a reduction in membrane growth. 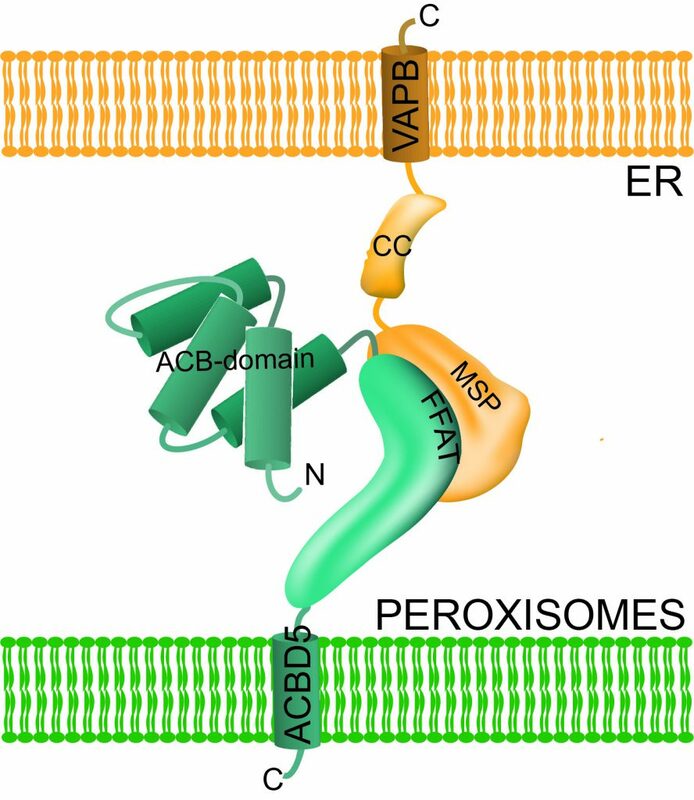 The experiment confirmed their suspicions that to grow and divide, peroxisomes need to acquire membrane lipids from the endoplasmic reticulum and that these exchanges take place at the membrane contacts mediated by ACBD4/5 and VAPB (see figure one). Mutations in either of these genes can cause neurological disorders. Patients with a defect in ACBD5 have recently been identified and VAPB has been linked to amyotrophic lateral sclerosis. Professor Schrader’s research helps to explain the mechanism behind this and moves the field another step closer towards developing new treatments. As well as unravelling the mechanisms that lead to these genetic disorders the team also work to raise awareness of these conditions and actively support the charity, Zellweger UK (www.zellweger.org.uk), in their work with patients suffering from peroxisome-based disorders and their families. There remains a lot to be learned about these enigmatic cellular structures and their function and role in disease. How peroxisomes interact and communicate with other organelles, how their numbers can be regulated, and how they contribute to neurodegenerative disorders, ageing and oxidative stress are still grey areas in current research that have potential for developing novel treatments. Professor Michael Schrader is a molecular cell biologist with expertise in mammalian/human cell biology, cellular compartmentalisation and cytopathology. He began his studies in biology at the University of Bielefeld, Germany, before going on to complete his PhD in Cell Biology at the University of Heidelberg, Germany. Professor Schrader has since held principal investigator positions in Germany, Portugal and the UK, where he is currently Professor of Cell Biology and Cytopathology in the Department of Biosciences at the University of Exeter. He is also Editor-in-Chief (Greater Europe) of the peer-reviewed journal, Histochemistry and Cell Biology. He was involved in education and training activities at the Universities of Heidelberg (GER), Marburg (GER), Aveiro (PT) and Exeter (UK) and currently teaches molecular cell biology and biomedicine for biologists and medical students. 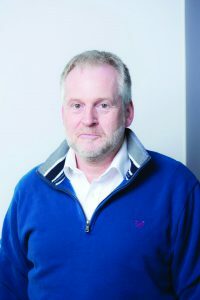 His research is at the interface of molecular cell biology, biochemistry and biomedicine, and combines multi- and interdisciplinary approaches, focussed on understanding the fundamental molecular mechanisms underlying organelle dynamics, function and biogenesis and their relation to inter-organellar communication, cell physiology and disease. Using peroxisomes as model organelles the group aims to unravel the molecular machinery and signalling pathways, that mediate and regulate the formation, dynamics and abundance of this medically relevant cellular compartment.